Wireless learning not only helps boost student self-esteem and independence, but creates more flexible classroom environments for individuals or smaller groups of differentiated learners. 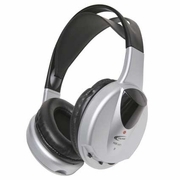 Our multipurpose Infrared Headphone can be used for monaural language-based activities or with the flip of a switch, also for stereo computer-based programs. The wireless headphone receives the audio signal from not only a classroom computer (Mac or Windows compatible) with the USB transmitter and extender connected, but also from our two media players equipped with a built-in infrared transmitter: the Infrared Music Maker Plus (2395IR) and the Infrared Cassette Player (3432IR). The headphone has an adjustable headband with ambient noise-reducing earcups to help block out external distractions and keep students on task. There is no limit to the number of listeners so long as they're within the 20' transmission range with a clear line of sight between the headphone and transmitter. Additional headphones (HIR-HP1) can be purchased for group learning activities without the need for a second transmitter.